The singer-songwriter, musician and guitarist achieved international fame starting out with his group the Wailers in 1963. The band lasted 11 years before disbanding and Marley began his solo career that gathered a quick following. He was known for infusing his spirituality into his hits like “No Woman, No Cry”, “Is This Love” and “Three Little Birds” to create true musical poetry. Bob’s father was a middle-aged white British naval captain named Norval Sinclair Marley. Bob’s mom, a black country village girl named Cedella, was just a teenager in the small Jamaican village of Nine Mile in Saint Ann Parish when Bob was born at 2:30 in the morning on Feb. 6, 1945. Norval instructed Cedella to name the baby boy Nesta Robert. Nobody knows to whom or what “Nesta” referred to, or whatever its significance. 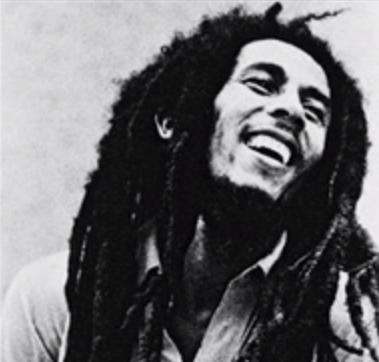 Later a Jamaican immigration official suggested to Bob’s mom that “Nesta” sounded too much like a girl’s name so they switched his name to Robert Nesta Marley. “Tuff Gong,” the name of Bob’s recording label, was a nickname Bob earned for himself in the Kingston ghetto of Trenchtown for being exactly the wrong guy to screw with. Ever. When he was a kid, one of Bob’s regular chores was to hike five miles through rugged country to fetch firewood so work was never a problem for Marley. He was famous for making his band rehearse hours and hours after any normal person would have called it quits. Bob, who at twenty-one married a beautiful Trenchtown Sunday school teacher named Rita, fathered an untold number of kids by an untold number of women. The general estimate puts the number of Marley’s children at around twenty, but Caribbean insiders have heard of as many as 32. When Bob discovered that the reason he was still poor after being so famous for so long was that his long-time manager and friend Don Taylor had been robbing him blind, Bob beat Don to within an inch of his life. Then he fired him. In July 1973, Bob and the Wailers opened a week of gigs for Bruce Springsteen. Later that year, they joined a 17-city tour of Sly and the Family Stone’s. After four shows, Sylvester Stone fired them for being too good and hogging all the adoration. For a long time Bob drove a BMW—which, as far as he was concerned, stood for Bob Marley and the Wailers. Bob was a professional level soccer player. Played a wicked game of ping-pong, too. Bob died of cancer (brain, liver, stomach, lungs) that started as a melanoma under the nail of his big toe. The day was May 11, 1981, Bob was 36. In one day, 40,000 people filed past his coffin as his body lay in state in Jamaica’s National Arena. 1945 Nesta Robert Marley is born at Nine Miles, St. Ann’s, Jamaica. Son of Norval Sinclair Marley, a fifty-something Liverpool-born captain in the British Army, and the teenage Cedalla Booker. The February 6, 1945 birthdate is believed to be the correct one, although no birth certificate has ever been found. Marley, having left school at 14, and trained as a welder, while concentrating on music in his spare time. In 1962 he records two singles, ‘Judge Not (Unless you Judge Yourself)’ and ‘One Cup of Coffee’ at a local studio by Leslie Kong , owner of the Beverley’s label. Forms the Wailing Rudeboys (later becoming The Wailin’ Wailers) with Trenchtown pals, peter Tosh and Bunny Livingston; they are joined by Junior Braithwaite and female vocalists Beverly Kelso and Cherry Green. The group undergoes extensive tuition with vocalists Joe Higgs and drummer Alvin ‘Secco’ Patterson, and records some 70-80 tracks for the Studio One label with Coxsone Dodd. The Wailers’s first single, ‘Simmer Down’, reaches Number 1 in Jamaica’s JBC Radio Chart. the group begin to release a series of singles that feature regularly in the Jamaica charts. Marries Rita (Alpharita) Anderson, The next day he leaves his new bride and their first child to head to Wilmington, Delaware, USA, where he joins his mother. Marley returns to Jamaica with some savings, setting up a record store in Kingston with Rita. Rita has converted to Rastafarianism, changing her name to Ganette Mander (meaning ‘Paradise’), following the visit to Jamaica of Haile Selassie I, Emperor of Ethiopia. Composition (‘Stir It Up’) and Danny Sims, Nash’s manager, signs Marley to Nash’s JAD label. Marley had begun exploring Rastafarianism 2 years earlier. Meets Mortimo Planno of the Divine Theocratic Temple of Rastafari in Kingston. Beginning of Rastafarian influence on Marley’s music. Bob, Bunny, Peter, and Rita record on Johnny Nash’s JAD label produced by Arthur Jenkins. Along with the rest of the Wailers, Marley fully embraces Rastafarianism. They link up with top local producer Lee ‘Scratch’ Perry on their newly formed Tuff Gong label. Perry brings in the Barret brothers, Aston and Carlton, as the Wailers’s rhythm section: they will become an integral part of the group’s sound. Debut Wailers album “Soul Rebel” released. Their debut release on Island is ‘Catch AFire’-heavily promoted bythe label. A UK tour, including key dates at the Speakeasy in London, attracts rock critics and other Island stars-the band’s Uk profile is further raised by appearances on BBC Radio One and BBC TV’s Old Grey Whistle Test. The Wailers appear at Max’s Kansas City Club in New York (the centre of American new wave activity a year or so later), supporting Bruce Springsteen. Second Island album “Burnin” released. Eric Clapton reaches Number 1 in the US singles charts with his cover version of Marley’s ‘I Shot The Sheriff’, taken from Clapton’s 461 Ocean Boulevard’. “Natty Dread” released. A significant difference o this album is that the group is now called Bob Marley and The Wailers. Tosh and Livingston have gone solo, possibly upset that Marley is now being heavily promoted as the frontman. Marley adds The I-Threes (female singers wife Rita, Judy Mowatt and Marcia Griffiths). Additional musicians on the album include Al Anderson (guitar) and Bernard ‘Touter’ Harvey (keyboards). The new Wailers play two classic dates at the Lyceum London, immortalised later that year on the album “Live!” from which a liver version of ‘No Woman No Cry’ is also released. The band has been enhanced by Junior Marvin (guitar), Tyrone Downie (keyboards, replacing Harvey) and Alvin ‘Secco’ Patterson on percussion, Marley’s original rhythm tutor from the early sixties. The Wailers play the Roxy, Los Angeles-a concert later listed in Rolling Stone’s 1987 feature Live! Twenty concerts that changed rock’n’roll. “Rastaman Vibrations” released. Bob Marley And the Wailers headline a festival in Wales-20,000 people are expected, but because of heavy rain only 2,000 turn up. Most shelter inside terraces so the group ends up playing to only around 100 people in the field. Gunmen break in to Marley’s home in Kingston during the Jamaican general election campaign. present are Marley, Rita, their manager Don Taylor, other friends and five children. All the adults are shot and wounded-Marley is shot in his upper body and arm, Rita receives a head wound, friend Lewis Griffith is seriously wounded as is Don Taylor, but all survive. Marley hides out in Jamaica’s Blue Mountains after release from hospital. Four days later he performs at the ‘Smile Jamaica’ festival, although he is unable to play guitar due to his wounds. Rita sings, with her head in bandages. The couple then go in exile for eighteen months, away from Jamaica. The Wailers are based in London, on and off, for three months while working on their next album, during which time Marley and Aston Barret are arrested and fined for possession of herb. “Exodus” is released-it reaches Number 8 in the UK album charts, later hitting Number 20 in the States. In Miami, a cancerous growth is diagnosed on one of Marley’s toes-the press is informed that it is a foot injury received while playing soccer. Doctors advise amputation of the toe, but Marley claims religious objection. The album “Kaya” is recorded in England: the single ‘Is This Love’ reaches the UK Top Ten. Bob Marley And The Wailers play the One Love Peace concert at Kingston’s National Arena-an attempt to link Jamaica’s feuding political parties; Marley symbolically joins hands of bitter rivals Michael Manley and Edward Seaga. Marley makes first, short trip to Rastafarianism’s spiritual homeland Ethiopia. The second Wailers live album “Babylon By Bus” is released. The Wailers are the first reggae act to play at Harlem’s famous Apollo Theater, in front of a backdrop featuring an Ethiopian flag, a portrait of Haile Selassie, and a collage of Marcus Garvey and other black freedom fighters. Marley performs at Zimbabwe’s Independence Day celebrations, before undertaking a major European tour, which includes a headlining appearance at the ‘Summer Garden Party’ at the Crystal Palace Bowl. The single “Could You Be Loved”, taken from the album “Uprising”, reaches UK Number 5. During dates at Madison Square Garden, New York, supporting the Commodores, Marley collapses while jogging. Cancer is detected. Marley is baptized at Kingston’s Ethiopian Orthodox Church, marking his conversion to Christian Rastafarianism: he takes the name Berhane Selassie. The following month he flies to the Bavarian clinic of Dr. Josef Issels. Marley dies at Miami’s Cedars of Lebanon Hospital, just days after arriving. He is buried on 21 May after lying in state at the National Arena, Kingston. A re-release of ‘No Woman, No Cry’ charts in the UK. A tribute to Marley in Montego Bay, Jamaica, forms part of the Fourth International Reggae Sunsplash Festival, including an appearance by the Melody Makers-four of Marley’s children. The “Legend” compilation is released: it spends 12 weeks in total at Number 1 in the UK album charts, and also becomes a permanent fixture in the US album charts. The Marley Museum opens in Kingston on the site of his home, headquarters of Tuff Gong Records. 6 February, his birthdate is declared a national holiday in Jamaica. Posthumous induction of Bob Marley to the Rock And Roll Hall of Fame. The induction speech is given by U2 singer Bono.